Seaweed has inundated the shoreline of St. Kitts, following a similar situation in the Keys and other areas recently. Senior Maritime Officer in the Marine Division, James Greene said the recent weather has resulted in the sea cleaning itself with the seaweed coming through the channel as a result of the change of the waves as a result of the recent passage of Tropical Storm Gonzalo. He said the layers of seaweed have both negative and positive impact. â€œThe thick layer prevents erosion of the sand if there are pounding or breaking waves. It can also be used by agriculturalists as manure when properly dried,â€ he said in a brief interview with the Communications Unit in the Office of the Prime Minister (CUOPM). The are confirmed reports of similar build up of seaweed at Frigate Bay and other beaches on the Southeast peninsular. 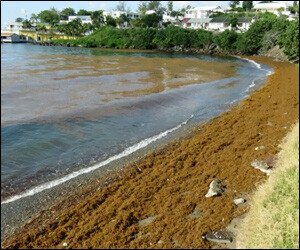 St. Lucia recently experience similar build up of seaweed on its shores in several areas with concern for the stench emanating from the decomposing seaweeds. St. Lucia Online reported that its countryâ€™s Agriculture Minister Moses Jon Baptiste, commenting on the issue in a previous interview said the issue is not overly alarming and explained a number of ways to deal with the situation as it arises. Concern was also expressed over the effects of a massive buildup of seaweed along St. Luciaâ€™s eastern shore, and have called on communities and agencies to band together to help rid the coast of the decaying mass. While St. Lucia has seen an increase in sea weed infestations, the issue has been a widespread phenomenon throughout the Caribbean.